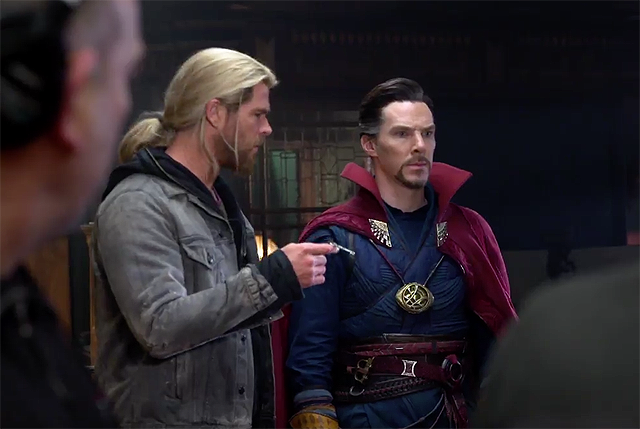 Ahead of the digital and home media release of the film, Marvel Studios and The Walt Disney Studios (via Chris Hemsworth‘s Twitter) have released a new Doctor Strange featurette about the end tag where the Sorcerer Supreme meets the God of Thunder. Watch Doctor Strange and Thor meet in the player below, and read about the other special features included on the release by clicking here. Click here to pre-order your digital copy of Doctor Strange with bonus features before it drops tomorrow! Doctor Strange is coming home to bargain this February with a Digital HD release on February 14 and a release on Blu-ray 3D, Blu-ray, Digital SD, DVD and On Demand on February 28. The Doctor Strange Digital and Blu-ray releases come packaged with over 80 minutes of fascinating, never-before-seen bonus materials, including five behind-the-scenes featurettes, five deleted scenes, hilarious outtakes, part two of the comical mockumentary “Team Thor,” audio commentary, and an exclusive look at the future of the Marvel Cinematic Universe. Doctor Strange stars Benedict Cumberbatch, Chiwetel Ejiofor, Rachel McAdams, Benedict Wong, Michael Stuhlbarg, Benjamin Bratt, Scott Adkins, Mads Mikkelsen and Tilda Swinton. Doctor Strange tells the story of talented neurosurgeon Doctor Stephen Strange (Cumberbatch) who, after a tragic car accident, must put ego aside and learn the secrets of a hidden world of mysticism and alternate dimensions. Based in New York City’s Greenwich Village, Doctor Strange must act as an intermediary between the real world and what lies beyond, utilizing a vast array of metaphysical abilities and artifacts to protect the Marvel cinematic universe.